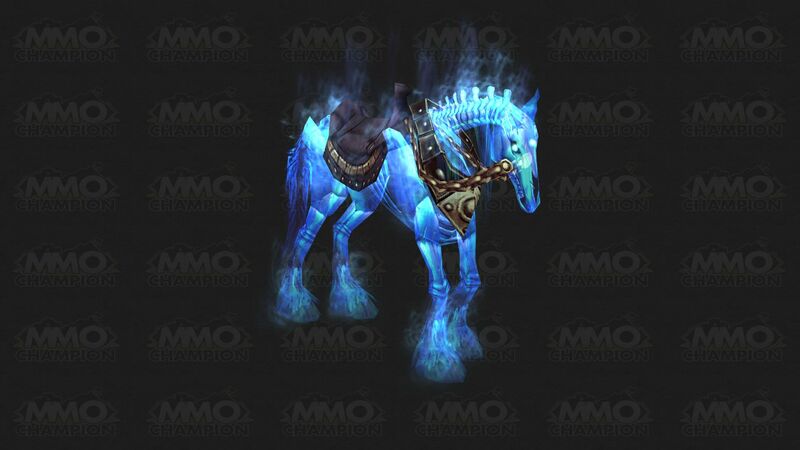 The datamined model for this looks very much like the level 20 undead horse mount, only with something similar to the blue spectral flair you see on mounts like sparklepony (i had to actually look up the real name, it has been so long since i needed to know, the 'Celestial Steed') or more likely inspired by the feet/leg areas of mounts like the crimson deathcharger. Also note that this one doesn't bind, so its ALMOST definitely a new TCG item, there is of course always room for change, but thats where i would put my money. MMO Champ had this picture, and this most likely is the mount. New tcg mount from the Betrayel of the Guardian tcg expansion. This mount will be released as the rare loot from the WoW TCG Expansion "Betrayal of the Guardian". The official release date is mid February 2013. The level min. level 20 mount (epic) can be traded in-game. Useable as both land and flying mount. Useable by all account characters at level 20 or greater on same BattleNet account. Latest information and screenshots can be found at www.wowtcgloot.com. Arvak? What are you doing here I thought I left you in the Soul Cairn! Name/look combo that make me think it would be ideal for those Palladins with a transmoged DK look. 섬뜩한 군마의 해골 is the Rare Loot Card from the 20th WoW TCG Expansion: "Betrayal of the Guardian". The set is themed around Medivh and Karazhan. Rare WoW TCG Loot Card From "Betrayal of the Guardian"
"Oh. OH! I see how it is! I'm not a real horse!" So i bought two packs of these cards. Opened the first one didnt get anything. I opened up the second one, flipped through, saw a shiny card. "Oh shiny card....wtf am I imagining it? OMG I just got the mount" Redeemed code, went into wow. Landro says "Oh sux2bu you cant redeem until 5.2". Then I proceeded to wish I could flag against The Black Flame if simply to kill Landro. Anyone know if this mount has unique sounds, like spectral kitty has? 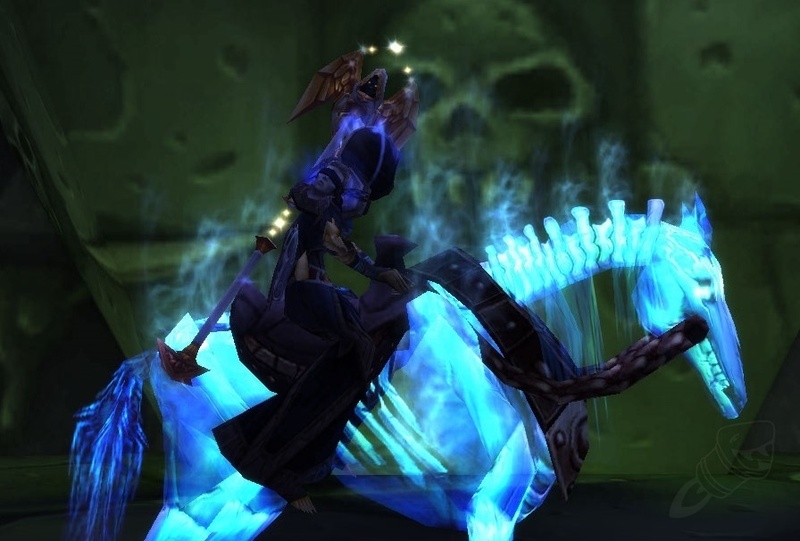 This mount is more spectral and a slight bit more ghastly than your average mount. Well, I am in love! Contrary to all the whinging surrounding this mount, complaining about "reused models" or "no effort put into it! ", I have eyes in my head and THIS mount has had effort put into it! I had expected a blocky spectral horse, but got a wonderfully "ghostly" mount that looks epic together with Shadowform on priests, and without it on other classes! It is also the ONLY level 20-model Forsaken horse available to the Alliance, and the only skeletal horse that can fly! My only problem with this mount is that it suffers from the "bent front legs" that can be seen in some other horses, + that it has a bug that makes the movement of the mount much faster than the actual speed it travels at. Hopefully will be fixed, but fix or not this has fast become a new favourite to me. I bought it for my collection, but it ended up on my /quickmount macro! I was expecting it to be a hog. Now i can't name msyelf Ghost Rider. This mount looks really awesome. I definitely like the look of it. As of March 13, 2013 the model has a slight change. When released it had a golden armor and chain. It now has a silver armor and chain. Being a lvl 20 mount, account wide, your alts can enjoy this in no time. Any class would look good on this bad pony. First Step: Visit World of Warcraft.com > Promotion HERE. (http://www.worldofwarcraft.com/misc/en/promotion.html) to retrieve your In game code. Entering your scratch-off code from your TCG card will generate a code that can only be claimed in-game in the realm you select, so be sure to complete the form carefully! This in game code is then used with 랜드로 롱샷. Fast way to get to him, take Flight Path to Ratchet and catch the boat that shows up at the dock periodically. Once in the new zone a short run down the docks and he is near the auctioneer in Booty Bay. Talk to 랜드로 롱샷, choose "Betrayal of the Guardian" > Ghastly Charger. Then either sell this mount for six figure gold amounts or learn it for yourself. Enjoy! Finally a cool new TCG Mount! Has pretty much the same basis as the Spectral Tiger as far as being a level 20 racial mount (but spectral). Definitely gonna be as popular as previous TCG Mounts. Equipping Crown of Eternal Winter while on this mount will increase your Ghastliness by 330%. I just got mine, and when people say it has a lot of fog they are not lying. It has like 3x the amount the Pally Warhorse or Warlock Felsteed has, and it's constant, not intermittent. I'll upload an image of my undead priest on it in Undercity to show off the effect better. It looks good anywhere, but insanely wicked in dark locations. Picture from front angle to show mists. Just got my hands on this, very cool looking. Also, it was a small consolation prize I got for myself since it's been another year with no Horseman's Reins...at least I have the other awesome flying horse. Shouldn't it be the "Same model as" Skeletal Warhorse? That mount looks sick/awesome I wish I had it. Screen shot of Ghastly Charger in Shadowmoon Valley. How much does the mount usually run for in AH? The mount is beautiful. I get many compliments on it, and it looks wicked in dark places due to the ghostly fog that arises from it's body. I also think it's very cool that you can see the ribs. However, this mount has the skeleton of a Horde undead skeletal horse, but despite having the same skeleton, it's slightly smaller. The size difference isn't very noticeable until you run on land with the mount, where the mount's little legs are running very rapidly, while on a regular skeletal horse, the legs don't move quite that fast. Only thing negative i'd say is I wish it looked like a skeletal warhorse instead of a skeletal horse...which doesn't have the horns. It would have looked more badass w/horns IMO. I spent 150k on mine and I think it was worth it. I am hanging out in Deepholm right now camping Aeonaxx, and my Charger looks pretty sweet in the dark atmosphere. I submitted a screenshot for your enjoyment. Just picked this up 600k, Expensive but all TCG mounts are now, especially on my realm. I was deciding this or Spectral Tiger but to me Spectral Tiger is too familiar, you see quite a few about so wanted something a bit different. Do I regret it? No way...... this mount is just pure epicness, unlike the Tiger it flies and like some people say, in dark areas it looks amazing. Already had 3 /w asking where I got it and that tells you all you need to know, its a beautiful mount. I'd recommend it over the Tiger, again too many people have the Tiger and its doesn't have the 'wow' factor this has. Swift Spectral Tigers seem to go for between 800k and 1.5 M, not much difference between it and Spectral Tiger. All offers I've seen for Ghastly Charger were over gold cap, due to the seller accepting gold on my realm. "Just" a gold cap if my gold was on their realm. No model viewer does this mount justice, even pictures really don't to well. It looks intense, specially in dimmer lighting / with various effects. The fog is STRONG, and the spectral-ness hides a lot of the older-ness of the actual model. It is slightly smaller so it runs faster then you would think (not to the extent of some pigs though) but it's not that bad. All and all, a epic mount indeed. Well worth the cost to pick one up. To everyone who says this mount flies, you're wrong. Believe it or not, its walking on air. I don't get it this mount has been out for ages, but now it popped up on new patch also Ive never seen anyone on this mount. Where do you get the code from to get the free Ghastly Charger Mount ? I entered my 25 numbers from the pre paid card and it says it's invalid ! I've seen this mount on realm AD prized at 999.999. Point one is: AD is an overprized realm, but point two: This mount is NOT in any way wourth that prize and you should not pay it. If I could have any mount in-game, it would definitely be this one. It's gorgeous! "메디브의 희생자들이 영영 세상에서 사라진 건 아닙니다."